Notes: Breaking & Entering Bourbon Whiskey is made by one of the earliest craft distillers, St George Spirits in Anaheim California in 1982. Originally Hangar One ( named after the Hanger at the Navy Air Base they were founded in, Hangar One was spun off to another group, and Saint George quietly kept going. Among their many other spirits, we have reviewed their Absinthe and intend to get reviews of some of their other spirits up as soon as we can find them. The Breaking and Entering Bourbon started as a project in 2011, with 400 barrels being tested and 80 being bought and blended to bring this bottling to fruition. Hats off to the guys for being upfront about what they did, where they got it from and how they made it, even down to the clear, no-nonsense explanation on the label. Finally, a clear narrative that I wish other people would follow. Most descriptions people put up on their websites and labels require a decoder ring, inner knowledge, and a fully functioning B.S. detector to even begin divining the provenance of their whiskey. First Impression: Bananas, a touch of molasses, caramel, oak, flower, honeysuckle, green melon, alcohol proportional and blended well into the bouquet. Taste: Nicely subtle with a touch of sweetness, a bit of a flash in the pan for mid plate, lightning quick rush, of bananas, corn and hints of rye, barley, and then gone too quickly with a finish is minty/grassy.Would be nice if it hung on a bit longer. Bottle: Long cylindrical clear glass with a longish neck ( long enough for most to wrap their hand around while pouring easily)and a nice decanter type bottom ( 1 inch or about 25mm) of clear glass to give it balance and stability. Somewhat muted graphics printed on a butcher or wrapping paper stock with an interesting mix of red and black printing that alternates with embossed printing and using a background color for graphics. I suspect a frustrated graphics arts degree major had a hand in this. A nice job and creative- but not overdone or overproduced. The label is a refreshing break from the mass of corporate, committee-designed work we usually see. 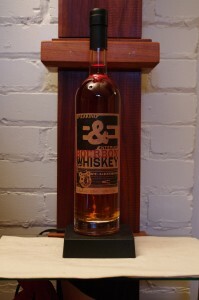 The back label has an entertainingly written backstory on the bourbon., Given the mischevious flavor of the distillery and its operators (I’ll leave it at that, knowing these people a bit) it dispenses with a lot of the mystery and pretense other blenders and bottlers love to indulge in. Neck capsule and closure is strongly reminiscent of the Buffalo Trace Antique series ( as indeed is the bottle ) with a black foil capsule.Downside/complaints are that there is no pull tab, you have to cut the foil, and the cork top is too damn thin and hard to get a grip on even with one finger. The foil crumples and spins as you try to open it adding to the problem. Synthetic cork at least mimics the sound of a real cork without the potential downside of floaters if at the cost of authenticity or at least romance of real cork. Other: Really like to see a higher proof version. Technically, due to the proof variations from barrel to barrel, they probably could not do a barrel proof version but something higher than 86, maybe a 92 to 100 proof range would be a definite improvement and make the whiskey easier to mix. Final Thoughts: A very nicely blended bourbon by people with a deft touch and superior palates.